Welcome to the LitCharts study guide on Colson Whitehead's The Underground Railroad. Created by the original team behind SparkNotes, LitCharts are the world's best literature guides. A concise biography of Colson Whitehead plus historical and literary context for The Underground Railroad. A quick-reference summary: The Underground Railroad on a single page. 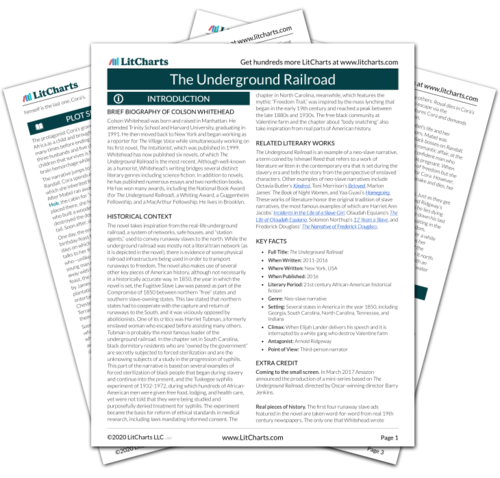 In-depth summary and analysis of every Chapter of The Underground Railroad. Visual theme-tracking, too. Explanations, analysis, and visualizations of The Underground Railroad's themes. The Underground Railroad's important quotes, sortable by theme, character, or Chapter. 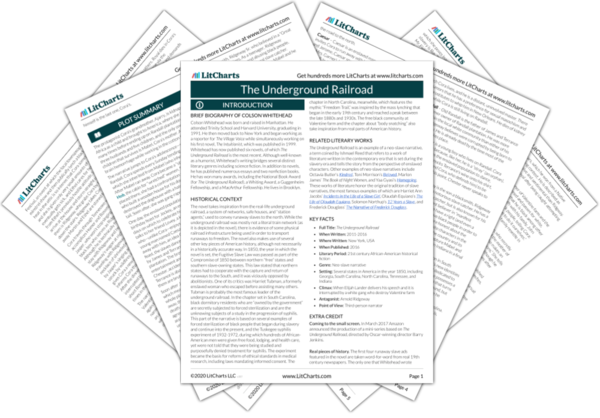 Description, analysis, and timelines for The Underground Railroad's characters. Explanations of The Underground Railroad's symbols, and tracking of where they appear. An interactive data visualization of The Underground Railroad's plot and themes. Colson Whitehead was born and raised in Manhattan. He attended Trinity School and Harvard University, graduating in 1991. He then moved back to New York and began working as a reporter for The Village Voice while simultaneously working on his first novel, The Intuitionist, which was published in 1999. Whitehead has now published six novels, of which The Underground Railroad is the most recent. Although well-known as a humorist, Whitehead’s writing bridges several distinct literary genres including science fiction. In addition to novels, he has published numerous essays and two nonfiction books. He has won many awards, including the National Book Award (for The Underground Railroad), a Whiting Award, a Guggenheim Fellowship, and a MacArthur Fellowship. He lives in Brooklyn. The novel takes inspiration from the real-life underground railroad, a system of networks, safe houses, and “station agents,” used to convey runaway slaves to the north. While the underground railroad was mostly not a literal train network (as it is depicted in the novel), there is evidence of some physical railroad infrastructure being used in order to transport runaways to freedom. The novel also makes use of several other key pieces of American history, although not necessarily in a historically accurate way. In 1850, the year in which the novel is set, the Fugitive Slave Law was passed as part of the Compromise of 1850 between northern “free” states and southern slave-owning states. This law stated that northern states had to cooperate with the capture and return of runaways to the South, and it was viciously opposed by abolitionists. One of its critics was Harriet Tubman, a formerly enslaved woman who escaped before assisting many others. Tubman is probably the most famous leader of the underground railroad. In the chapter set in South Carolina, black dormitory residents who are “owned by the government” are secretly subjected to forced sterilization and are the unknowing subjects of a study in the progression of syphilis. This part of the narrative is based on several examples of forced sterilization of black people that began during slavery and continue into the present, and the Tuskegee syphilis experiment of 1932-1972, during which hundreds of African-American men were given free food, lodging, and health care, yet were not told that they were being studied and purposefully denied treatment for syphilis. The experiment became the basis for reform of ethical standards in medical research, including laws mandating informed consent. The chapter in North Carolina, meanwhile, which features the mythic “Freedom Trail,” was inspired by the mass lynching that began in the early 19th century and reached a peak between the late 1880s and 1930s. The free black community at Valentine farm and the chapter about “body snatching” also take inspiration from real parts of American history. The Underground Railroad is an example of a neo-slave narrative, a term coined by Ishmael Reed that refers to a work of literature written in the contemporary era that is set during the slavery era and tells the story from the perspective of enslaved characters. Other examples of neo-slave narratives include Octavia Butler’s Kindred, Toni Morrison’s Beloved, Marlon James’ The Book of Night Women, and Yaa Gyasi’s Homegoing. These works of literature honor the original tradition of slave narratives, the most famous examples of which are Harriet Ann Jacobs’ Incidents in the Life of a Slave Girl, Olaudah Equiano’s The Life of Olaudah Equiano, Solomon Northup’s 12 Years a Slave, and Frederick Douglass’ The Narrative of Frederick Douglass. Coming to the small screen. In March 2017 Amazon announced the production of a mini-series based on The Underground Railroad, directed by Oscar-winning director Barry Jenkins. Real pieces of history. The first four runaway slave ads featured in the novel are taken word-for-word from real 19th century newspapers. The only one that Whitehead wrote himself is the last one, Cora’s. Seresin, Indiana. "The Underground Railroad." LitCharts. LitCharts LLC, 10 Apr 2017. Web. 24 Apr 2019. Seresin, Indiana. "The Underground Railroad." LitCharts LLC, April 10, 2017. Retrieved April 24, 2019. https://www.litcharts.com/lit/the-underground-railroad.